I was lucky enough to buy a lovely large leg of lamb just before Christmas, which is stashed away in my freezer, (along with the great shoulder of pork and a big hunk of topside of beef). I bought my lamb from our favourite William’s Farm Kitchen, at Hornsea Freeport, who specialise in locally produced meat. Our leg of lamb was sourced from Milton Farm, near Selby, not that far away, and, this weekend, is going to be transformed into a magical dish of Slow-roast Persian Lamb with Pomegranate Salad. Recently I have become more interested, food-wise, in the flavourings and taste of North African/Moroccan/Middle Eastern cookery. A warm touch of heat (not too fierce), tinged with a touch of sweetness, often using dates, dried apricots, pomegranates etc. A more subtle flavour than those recipes using intense chilli heat. I find that if a dish is too fiery, I cannot taste the finer flavours when eating, which is, in my mind, a bit foolish. Everyone’s taste buds are different, individual – I know both my sons enjoy very hot spicy food – but for me, a little bit of heat plus sweetness is sheer heaven. So, head down and doing my favourite bit of research, with the knowledge that one of my favourite authors, Yotam Ottolenghi, has a website not only sharing his very tasty recipes etc., but he is also selling the special ingredients to create just the kind of dish I want to make this weekend. For instance, I know that I can buy Pomegranate Molasses from some supermarkets, but I can’t help thinking that if I buy this exotic product from the Ottolenghi website, it will be a very special Molasses. And the prices are not extortionate at all. In fact, for keen cooks it is a pleasure to spend time just browsing the unusual ingredients, and the packaging of the spices in little bottles with the Ottolenghi logo stylishly added in a restrained way is just a pleasure to behold. Back to this Persian Leg of Lamb recipe. It didn’t take me long to find not one, but two recipes, both on the Good Food site, for Persian Lamb. One was a tagine, using lamb neck fillets, and the other was for the Slow-roast leg of lamb. I loved the spices used in the tagine recipe, and, yes, it does look ‘prettier’. 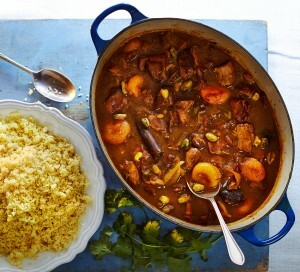 but, as I have this great leg of lamb, I am going to combine the flavours of the tagine recipe with the method of cooking the slow-roast lamb. (Hope you’re following my way of thinking here.) Right. Now to combine the two recipes. Fingers crossed. This recipe for Slow-roast Persian Lamb with Pomegranate Salad is a mixture of 2 recipes I found in Good Food, plus a little bit of my own ideas. The Lamb should be cooked slowly until it virtually falls apart, full of wonderful aromas and with a sauce that just needs to be mopped up with some good flatbreads, or a wonderfully crusted Sourdough loaf. The Pomagranate Salad adds just a touch of lightness to the very aromatic dish. To cook in an AGA: This will take 4 - 5 hours in an AGA - See below. When you have added the water, spices, lemons etc around the Lamb, place the roasting dish on the hot plate of the AGA and bring carefully to the boil. Remove from the hot plate immediately, place the lid on the dish and place the Lamb etc. in the AGA Simmering Oven for 3 hrs 15 minutes. Remove the lid or foil, add apricots and dates and stir gently. Replace lid and return to the Simmering Oven for a further hour. Remove the lid and roast for another 30 minutes to give the Lamb a good colour (put in the top of the Baking Oven for 10 minutes if necessary to colour). Finish off as in main recipe, putting the roasting dish on the Simmering Plate of the AGA simmering gently until the sauce thickens. In a small bowl, mix the molasses with the cumin, lemon juice, olive oil, garlic, coriander, chilli powder, turmeric, black pepper and salt. Scatter the chopped onions in a large roasting pan or oven-proof dish, and lay the lamb on top. Pour the pomegranate glaze and spices mix over the lamb, and massage in, all around the joint. Using the small bowl that held the pomegranate mix, fill with about 200ml water, and add the saffron cinnamon and the preserved lemons. Pour the water, spices and lemons around the lamb (not over it, or you will rinse the marinade off). Cover the roasting dish with a lid or a secure piece of strong foil folded firmly around the edge to seal the dish well. Roast the lamb, undisturbed, for 2hrs 30 mins, then remove the lid or foil. Add the apricots and dates, and stir in gently. Cover with lid or foil, and return to the oven for a further 30 minutes. Remove the cover again, and roast for another 30 minutes to give the lamb a good colour. Remove from the oven, and place on a hob. Remove as much fat as is possible. Adjust the seasoning, adding more salt and pepper if needed. Mix the cornflour with the rosewater and 3 tbsp cold water, put a spoonful or two of the stock in the roasting dish and mix in well, then tip into the roasting dish, stirring carefully as the sauce thickens. Just before serving, gently toss all the salad ingredients together. 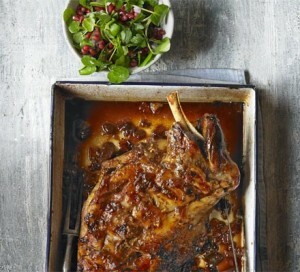 Serve the Slow-roast Persian Lamb with its sauce and with the Pomegranate Salad and some warmed flatbreads to mop up the juices. Well, I remembered the most important thing – to get this special leg of lamb out of the freezer, and now it is sitting on the worktop in a big dish, very slowly starting to defrost. I’ve just about enough room in the fridge to leave it in for the next two nights. Next job – check through all my herbs and spices to see if I have to add to my shopping list. Erik and I are totally looking forward to trying this Slow-roast Persian Leg of Lamb recipe on Sunday, so if I can improve my camera skills, I will take a few pictures and tell you how well it turned out. But after writing the recipe for this dish, I can almost smell it’s wonderful aroma. Roll on Sunday!